When you have instability of the knee, the knee compensates in many ways to keep itself functioning. One way the knee tries to stabilize itself is with the collection of fluid. The fluid acts as a brace to keep everything in place as best it can. 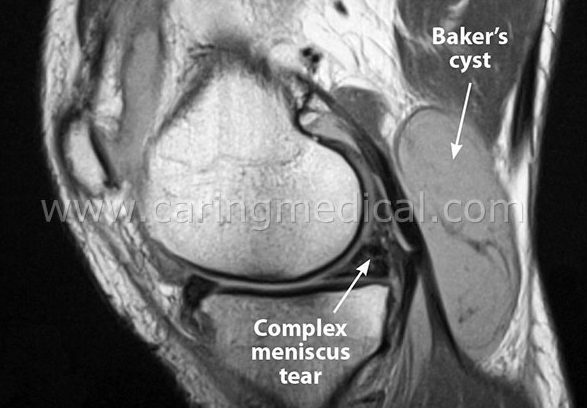 In the case of a Baker’s cyst, the accumulation of fluid occurs in a sac behind the knee, causing discomfort and difficulty bending the knee. Often, patients get these cysts drained only to have them fill right back up again. Why does that happen? Draining a cyst does not address the joint instability that caused the cyst to form in the first place. Neither does surgery. The surgical treatment of Baker’s or Popliteal synovial cysts remains controversial. The reason is high failure rate and further controversy over the long-term consequence of arthroscopic knee procedures. The controversial treatment of a persisting Baker’s cyst involves draining the cyst, usually repeatedly, and/or surgery to remove the cyst and surgically repair any damage to the surrounding tissue including meniscus tears. Again, the problem with cyst draining and surgery is that both of these approaches do not address the root cause of the condition properly – that is knee instability. Further, surgery involving any joint, and especially the knee, is very invasive and prone to post surgical problems. In simple terms, the damage in the knee that is causing the swelling needs to be fixed in order to fet rid of a Baker’s Cyst. If nothing gets fixed, the problem persists. After one year, a Baker’s cyst was still present in 85% of patient’s tested. Despite a reduction in associated Baker’s cyst related symptoms from before surgery (71%) to after surgery (31%). Of the patients who had reported Baker’s cyst associated symptoms pre-operatively, (44%) still complained of such symptoms one year after surgery. Why the dextrose? Because the dextrose had an impact of the amount of glucose in the knee. Glucose in correct amounts is necessary for wound healing. Too much glucose as seen in diabetes results in healing problems. The dextrose had a regulatory effect and created a “hypertonic” situation, that is it added to the water pressure levels of the cyst innards. Because of the added pressure, the liquid began seeping out of the cyst and back into the knee joint where regular immune system functions could remove the fluid. Address the instability by receiving Prolotherapy to tighten the loose ligaments and the joint will stop swelling! We have excellent results using Prolotherapy to help patients with Baker’s cysts resolve the pain and keep the cyst from returning! Prolotherapy, stimulated the injured tissue, whether it’s the ligaments or the meniscus, to repair itself. Once repaired, the knee joint becomes more stable, which means no more joint swelling. This in turn means no more accumulated fluid and an end to the baker’s cyst!